It’s a great time we live in.. 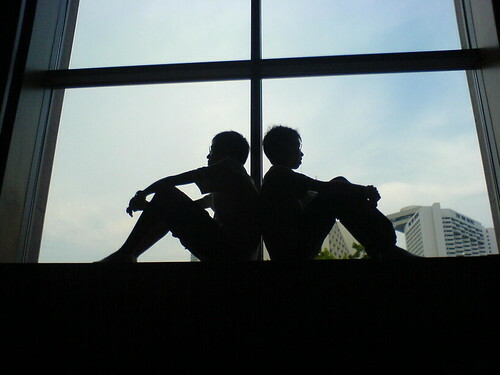 The cultures of the world collide and bring about mixtures and concoction of unrelated ideas, concepts and themes.. When it comes to music, such collaborations have always fascinated me, especially when one party is playing something that’s Indian or related to something Indian (simply because that one music I somewhat understand). In January, the Orpheus Chamber Orchestra of New York, played the piece they had commissioned Pt. Ravi Shankar to compose for them. While that itself is an interesting combination of music and talent, Orpheus also performed the concerto along with Anoushka Shankar, who played the Sitar parts. Anoushka has already made her name in the contemporary Indian music field, as well as the various fusionistic projects she has taken up. The best part of this project, was the Raga Saga. Orpheus worked with filmmakers Chris and Alex Browne to records many rehearsals and interviews with the various artists, and decided to publish them online, weekly leading up to the concert. It was really interesting to see what goes behind the scenes of such a project. Espcially since we see two great cultures and traditions meeting and working with each other to create something new and wonderful. The webisodes also give us an insite on the challenges faced by the artists and the way they resolved them. Anyone who’s interested in the scientific aspect of music would surely enjoy watching it. Furthermore, it is really amazing to see musicians using new media like webcasts to deliver their content. Especially musicians in this field. And I am sure this moved has helped. Without this webcast I would have never known about Orpheus or this project, and now I will probably buy the CD if they come out with one.. The usual banter about how industries should use new media aside, I would urge everyone with remote interest in Indian Classical or Western Classical or Fusion Music to check out the Orpheus Raga website, and especially the Raga Saga series of webisodes (you will have to register for a free account. Trust me it’s not THAT hard.. ). The live concert is avaliable for listening at the website also. Ambar pe milte hain qadmon ke nishaan tere hi, har shaam. Khidki pe likhe kooi, oo uus kii boondon se tera naam. Ki such much kya hai tu duniya me? Audio geekout at Esplanade on May Day.. Thanks to references from by some family friends, I got a chance to “consult” the Esplanade sounds engineers during a concert last week. It was a North Indian (Hindustani) Classical Musical concert organized by Engage: Consumer Interfaces, an events organization founded by two (I believe) IIM alumni. Engage has been bringing many great artists from India to Singapore for concerts for the past few years. This year, they invited Pt. Sanjeev Abhyankar and Dr. Ashwini Bhide-Deshpande for 2 separate concerts on two evenings, 1st and 2nd May as a part of the “Young Masters in Concert“. I went a few hours before the concert for sounds checks. Now, if you have ever been backstage at Esplanade, you’d know that place is a freaking maze. There is no way anyone can figure out the place without a map. I did get lost.. a few times. 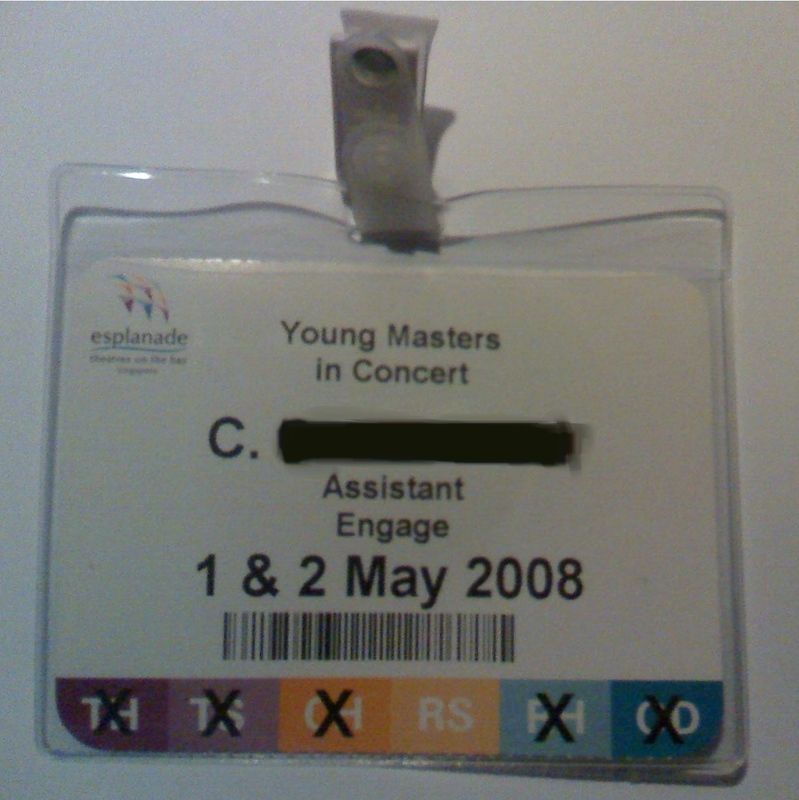 Luckily, thanks to this pass, I had free access to the backstage for two days! The concert was held at the Recital Studio of Esplanade. The stage was just being miced up as I arrived. They were using a Sennheiser EW series wireless mic for the main vocals. 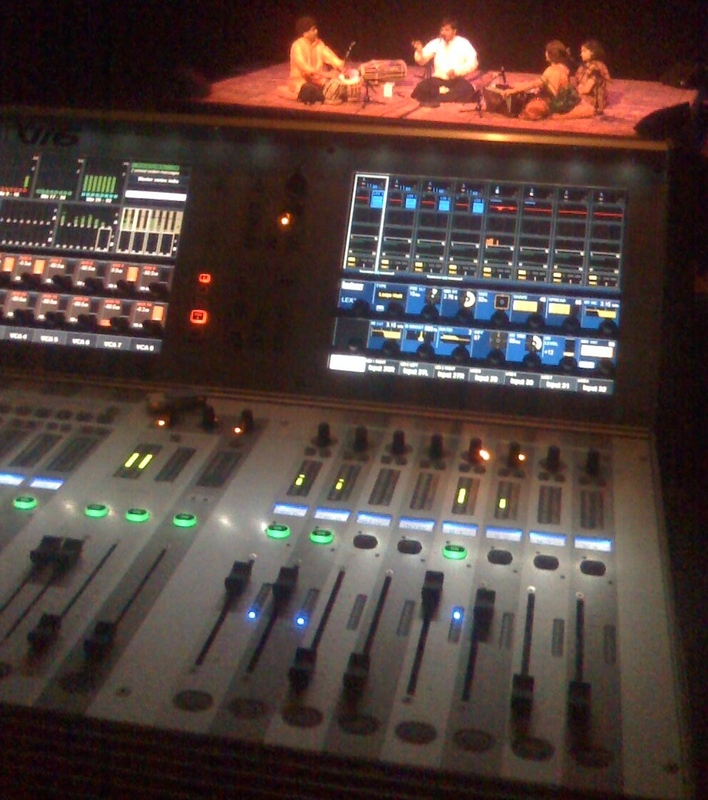 A Sennheiser 441 for the Tabla, a Shure SM58 for the Harmonium and Shure SM57s for everything else form the electronic Tanpuras to the Manjiras. The Sound Engineer knew his Indian instruments and told me that he had chosen those mics on purpose, considering the sound of the instruments, the room and the atmosphere that was needed. Next, we did the leveling on the console. 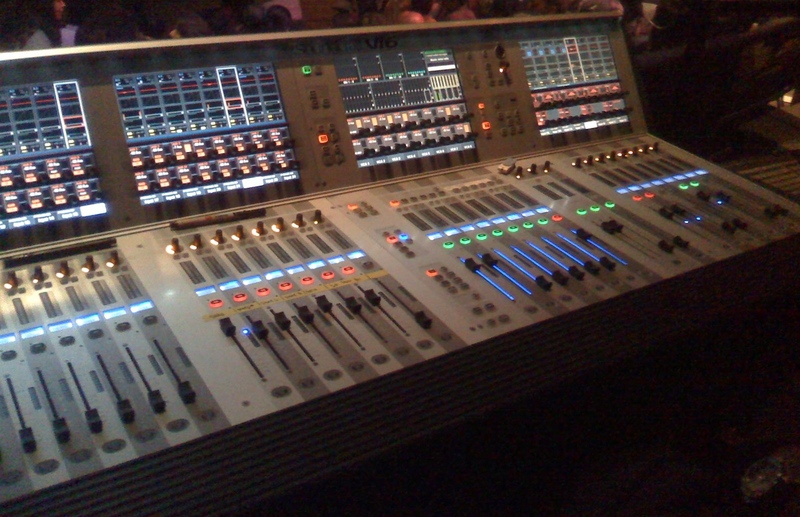 The console was a Soundcraft Vi6. Here are some pictures of it. The console totally blew me away. The I/O capabilities are totally unheard of, and the control surface itself had 40 motorized fades, 5 Vistonics II touch screens, and loads of stuff I did not even know about. 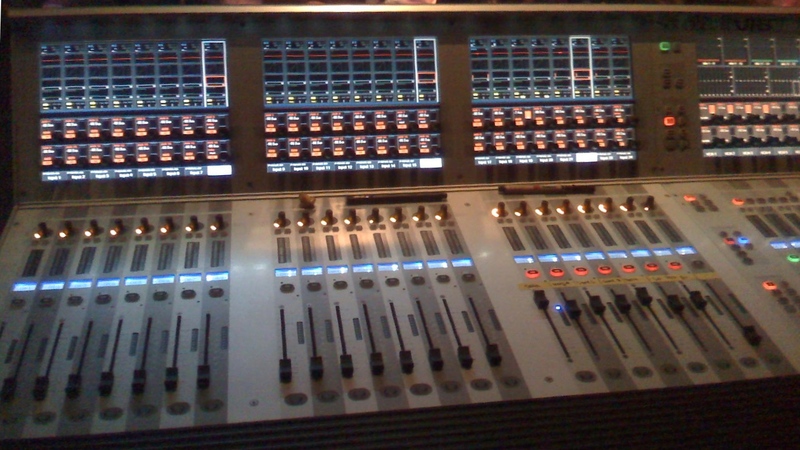 I was just too fascinated by the flying faders for the 1st few minutes to look at any other details. The Vistonics II screens allowed the selection of any part of the signal chain, which then showed up on faders for detailed control. The Vistonics II touch screens also had knobs and buttons to do more settings. The configuration options were unbelievable and totally confusing. And finally it had an awesome glow in the darkly lit Recital Studio. The levels for Pt. Sanjeev Abhyankar‘s concert were set too hot IMO. But he insisted on them. The classic sound engineer’s dilemma; Artist Expression or Audiences’ Ears? The levels for Dr. Ashwini Bhide-Deshpande concert were set nicely. Though she tended to move away from the mic, causing issues later during the concert. After the sound check I went out for a break, and came back just before the concert itself. All through out the concert, the Sound Engineer kept adjusting the levels and the gains for the various instruments by himself, and according my suggestion (which as my “job”). However, around 30mins in, he pulled up a screen using the Vistonics II touch screens for a effects processor module which he had placed in the signal chain. It was a reverb module from one of Lexicon’s effect processors. Here are some shots of the screen. The amazing thing about this module was the fact that it could use the current BPM information, which had to be fed in either using a know or tapping a button on the beat, to improve the reverb processing. It also had parameters like room size, room type and more to control the reverb effect. While the Recital Studio itself had been deadened using curtains and all, the reverb processor was being used to bring warmth to the sound.. Both the concerts totally rocked. Though I personally preferred Dr. Ashwini Bhide-Deshpande’s recital. Her voice, the music and the atmosphere was totally mesmerizing. It was a great experience for me both from musical and technical perspective. Oh and I also got to share a car ride home with Pt. 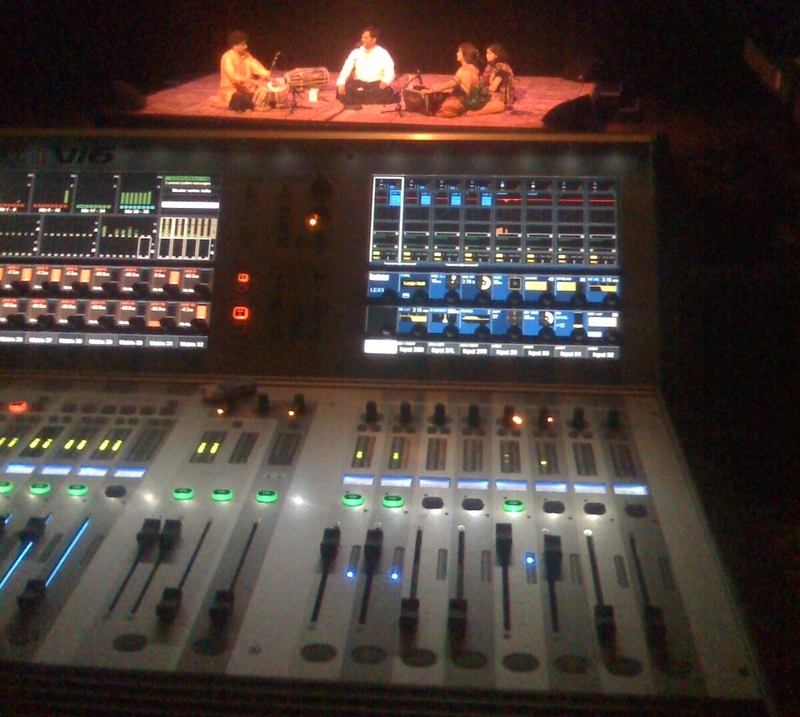 Sanjeev Abhyankar :D.
I am hoping to do such stints again, and hopefully one day learn to professionally handle such consoles and mic such concerts…. It’s when great technology meets great music, the magic happens..
What do you get when you put the some of the best artists together.. You get something like PD7. PD7 is a track in Anoushka Shankar’s new album Breathing Under Water in collaboration with Karsh Kale. The credits for this track include some BIG names, and some awesome artists. This track features..
Anoushka, for the unenlightened, is the daughter of Sitar Maestro Ravi Shankar. And I will say that her Sitar sounds as sweet as her fathers. But, what I have been realising with each of her albums, is that her orchestration is also amazing.. Ofcourse, she does have some amazing artists to help her along. PD7.. probably named after Puriya Dhanashree, the raag which the song is in and the Rupak taal which has 7 beats, which it is set in; has amazing vocals from Shankar Mahadevan and including Sitar-Vocal duets with Anoushka; great ambience… thanks to the Punditz; awesome percussion and tabla by Karsh and a lovely opening by Pt. Vishwa Mohan Bhatt. The composition in Puriya Dhanashree is very melodious and works well with all the base and electronica around it..
It’s a track you can’t get enough of.. Just can’t.. Here is a preview of the track. The (not so) calm before the Storm. I attended the later part of the WOMAD@Campus yesterday. It’s basically a fringe event of WOMAD at NUS, where they have a preview of some of the highlight artists of that year with small gigs or workshops. Mostly lasting ~30mins. Reaching UCC at ~9 I managed to catch last 3 gigs there. Here is the review. Etran Finatawa (Niger) featuring NUS Chinese Orchestra. This seemed promising. Fusion and jams are always the best part of WOMAD. But it was a complete let down. The Nigern group had interesting sound, but both their tunes were very similar, and it got boring pretty soon. The mixing was done badly, and it was not possible to distinguish the various instruments. The song led by the Chinese orchestra was the only listenable one of the lot. Damn he was right…. And thus ended the calm before the storm… Dhol Foundation finally lived up to their expectation, by getting everyone to Bhangra on their feet. Though, I will say that the mixing was screwed up again, and I was unable to hear any of the background tracks they were using. I really thought that the Celtic track they did was amazing, just needed to hear more of it behind the Dhols. So here’s to the Dhol Foundation.. Oye Chak De Fatte!! It’s THAT time of the year again, and I am excited!!! So Womad 2007 is happening on the 24-26th August at Fort Canning Park. The line-up this year is not as great as last year’s. Except for the Asian Dub Foundation, I have not heard of any of these Artiste. But, I have always been proved wrong , and the least known Artiste have performed the most amazing acts at Womad in the previous years, and hence, I shall not comment anymore on the line up. Here is a short list of who’s gonna perform. Once again, to help people with slower connections or without flash support, I have created a pdf document of the line up and schedule. You can print it out and bring it to Womad as well. However, you will have to go back to the website for other stuff like details about the artists and other information. The prices have gone up this year. It’s S$58 at the gate, but if you are a student, you can get student’s discount at $35. I still feel it’s totally worth it for the amount and quality of entertainment one can get at Womad. As I wrote in my review last year, the Atmosphere, Music and Spirit come togather to create a hell of an event. So who else is going?? ?